Despite knowing the Stackhouse fits him well, I was still nervous until I got my trainer's stamp of approval. I have a history of going about things in an unconventional way (saddles purchased on eBay/without a fitter, acquiring a pony without her, acquiring a pony in general, getting a breed not typically known for eventing, giving my own shots, the list goes on...my trainer is a saint) which I think made her nervous in the past. Now that I have a history there and credibility, I feel better about trusting my own abilities and doing things "backwards," but her approval still means the world to me. Before the ride, she took a look at it, complimented the fit, agreed with me on the necessity for a back riser and said "...and a Stackhouse," with a note of comradery and approval in her voice. "You'll be able to resell this easily if he does outgrow it." That, combined with a hearty, "He does seem to really like that saddle," after she'd taught us in a part lunge/part under saddle lesson, was all I needed. Stop taking me so seriously. 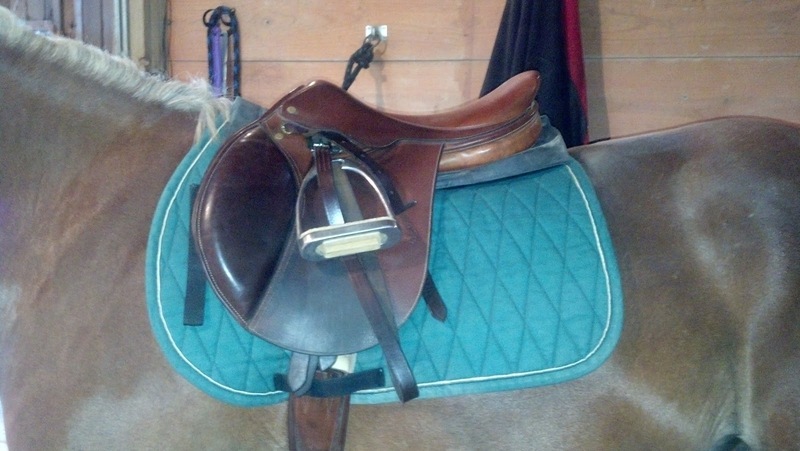 I actually really like riding in this saddle, just not looking at it. That means with our current Dressage focus, I won't see much of the Stackhouse, which just doesn't agree with the stirrups being even a hole longer than jumping length. Perfect for fences, which is what I bought it for, not so great for wrapping my leg around him and sitting deep. Plus I needed some saddle-ular eye candy. As one final note on my beloved Beval, it is now being loved by a little girl in Massachusetts, according to my eBay feedback. That makes me happier than the news that some inanimate object I used to own is well-loved really should. What a relief to have something that fits. Glad your saddle shopping journey has ended. For now.